Born in 1970 in Jamshedpur, Samit Das began his formal artistic training at Kala Bhavan, Santiniketan in 1994, where he continued on to do his Masters degree two years later. In 2000, he participated in the Associate Student Post Graduate Program at the Camberwell College of Art, London. Das was the recipient of the BRIC scholarship which led to him spending time in Italy in 2011. He was recently chosen as a Pernod Ricard Fellow. Samit Das’ practice is influenced by his fascination with documentation and the archive. 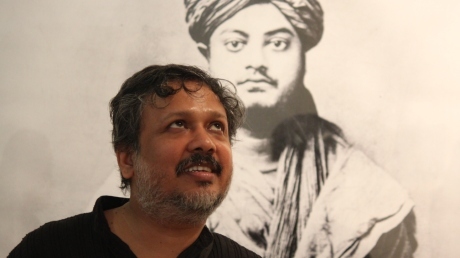 Das’ love for the archive and his Santiniketan roots culminated in a documentation project at the Tagore Museum in Kolkata between 1999 and 2001. He went on to work on another project – an exhibition titled The Idea of Space and Rabindranath Tagore that was exhibited in numerous venues including Lalit Kala Academy (New Delhi), India International Centre (New Delhi) , Victoria Memorial Hall (Kolkata) and Freies Museum (Berlin).